Connie Beaudoin and Peter Berley cut elegant figures in their large and open Parisian apartment in the eighth arrondissement. 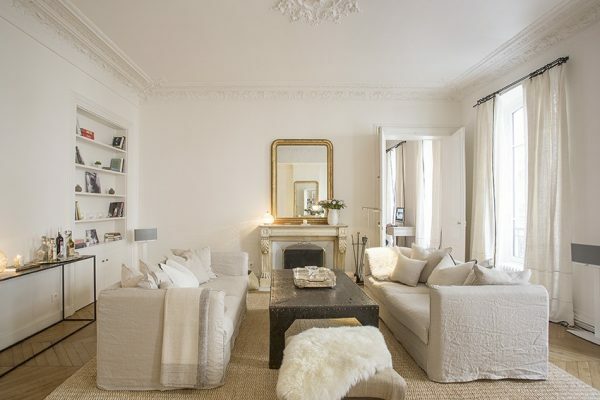 Connie, a yoga teacher, is slim and icily blonde, padding gracefully around their new home, pointing out the high Haussmanian ceilings, the original wooden flooring, the treasures they found on their explorations around the city. Peter used to be a member of the bar in New York and is now retired. He is dapper, with a dry sense of humour, and the couple seem relaxed and at home in the space. They are in Paris for a few days after spending some time in Bali and before returning to the States, and are enjoying the chance for some downtime in Paris. It took them a while to get to this point, but it had been a dream of theirs almost from the moment they met. It was in November 2014 that they came to Paris together and started tentatively putting out feelers for the apartment hunt. They met Susie and the Vingt Paris team quite early on in the search. Connie laughs, “That first meeting with Susie seemed to be something magical as well.” The couple had breakfast with Susie on their second day after arriving in the city, which they say was a real turning point in their journey towards buying an apartment in Paris. “We met a lot of other realtors, but when we met Susie we felt a connection. We felt like we would not be led astray,” says Connie. The couple say that the lack of a language barrier was a real bonus. “We saw immediately how much more helpful that was. We saw that it was going to be an unfamiliar and difficult process, and that it was important to have as clear communication as possible,” says Connie. Susie helped them to better define what they were looking for, and they began to see apartments straight away. At first, they left their search open, initially looking at the fun and hip Marais district, but they were put off by the large number of tourists that tend to stay in the area. The eighth arrondissement is in an upmarket part of town, with stately wide boulevards and one of the city’s most beautiful parks, the Parc Monceau. From their apartment, Connie and Peter can walk to the Champs Elysées, the Eiffel Tower, and the famous luxury shopping street, the rue du Faubourg Saint Honoré. However, they often walk much further than that, preferring to explore the city on foot. 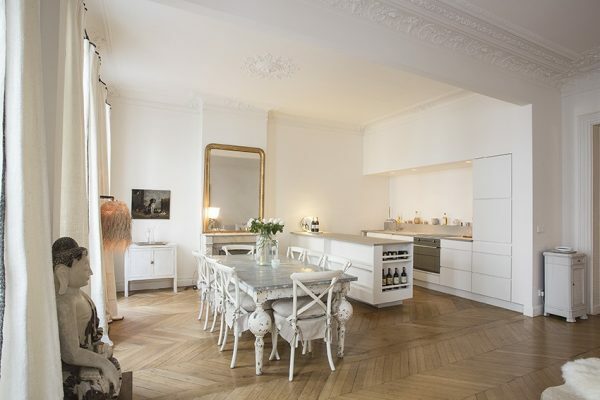 The apartment is located in a perfect position to explore the cultural side of Paris, and the couple use their time in Paris to visit the city’s many museums, operas and restaurants. Both are adamant that the whole process would have been a lot more difficult without the help of Susie and Vingt Paris. “Susie is very persistent and very diligent. Her work ethic is unbelievable,” says Peter. Susie helped them with the sale, from start to finish. They found the apartment in November, and were able to move in in June 2015. Vingt Paris helped them with finding a French notary to close the deal, and then was able to provide advice and assistance long after the apartment was officially theirs. 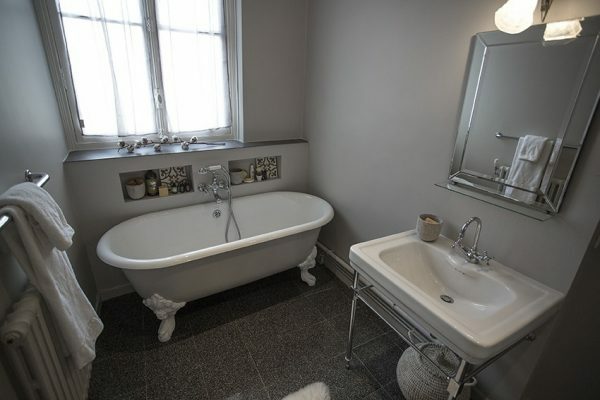 The apartment has been luxuriously furnished in neutral tones of cream and grey. 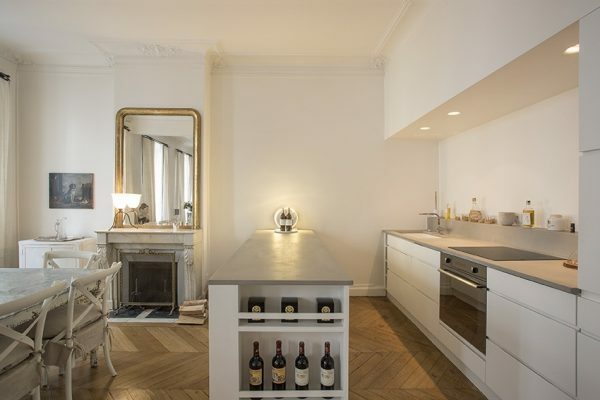 A large Buddha statue that they picked up at the puces de Clignancourt (a famous flea-market in the north of the city) dominates the open-plan kitchen and living room. It is obvious that the couple are deeply serene in the space. They both speak volubly about their love for their new home, and the city. “There is a deep, deep sense of history here that you really feel in your bones, and we have a deep respect for that. There’s a resilience here and a beauty that people count on,” explains Connie. “We come here knowing that it’s beautiful whether it’s cold, or it’s rainy, or there’s been a tragedy. We count on Paris being Paris.